So Sinbad was marooned, alone without food and he had lost all his money again. 'Yes, yes! You told me that last night.' Said the a grumpy King, who had spent all night awake thinking of giant whales and riding seahorses. Sherazade turned red and continued her tale. Sinbad climbed a tree to look further around the land he had found himself in. In the distance, across a wide open plain, he saw something white, gleaming in the sunshine. He thought, perhaps it could be a city, a large dome of some important building. He climbed down and set off towards the white object but when he got closer, he saw that the object was alone on the plain, and that it was some huge globe. Sinbad walked around it but there was no way into this ball or anyway of climbing upon the object. Then, he heard a hissing sound and saw that a monstrous snake was approaching him, slithering across the ground. Sinbad tried to hide behind the white globe but the giant snake followed him round lifting its head, opening its mouth ready to strike with venomous fangs and then swallow poor Sinbad. But luckily it was disturbed by the sky suddenly growing dark, although it was midday. 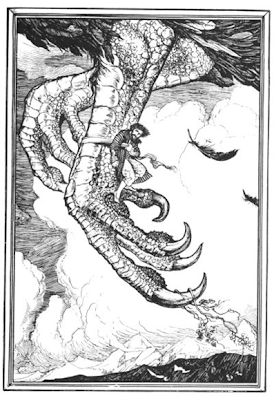 A giant bird had covered up the sun, then swooped from the sky and seeing the snake nearby swallowed it whole.